I was reading my daily chronological bible yesterday and read Psalm 122:6-7 “Pray for peace in Jerusalem. May all who love this city prosper. O Jerusalem, may there be peace within your walls and prosperity in your palaces.” Me: Lord. I pray for peace in Jerusalem. I forget to pray for Jerusalem because I don’t really think about them. Help me to love Jerusalem. Remind me to love them. Maybe I should go visit there in person so that I will remember. But I do pray now for peace and prosperity for them. This is why I like to read the Bible regularly. Otherwise, I completely forget these things that you want us to pray for. I don’t even remember my own prayers half of the time. 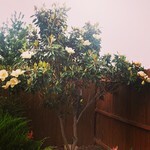 I looked up from my Bible and saw magnolia blooms on a tree in my backyard. Suddenly, I remembered my magnolia prayer.